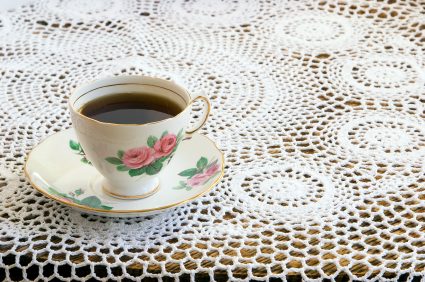 Hospitality tips: 3 things I learned from Grandma Gloria. What's your favorite memory of staying somewhere with a fabulous host? 1. Make your home liveable, not an untouchable museum. A home should be attractive and comfortable. But if everything within reach is breakable, your guests may feel like fleeing for safety. There's nothing worse than being afraid you'll knock Granny's vintage crystal lamp off it's tiny marble table. Keep the breakables safe in out-of-reach curios and up high on wall shelves. The furnishings where people sit and hang out should be sturdy, approachable, and comfortable. After all, when you say, "Make yourself at home," your guests will appreciate it if you mean it. 2. Liven up bedding with sweet memorable scents. Grandma Gloria's sheets smelled like fresh ginger. To this day, when I smell ginger root, I think of the sunny back-room at Grandma's where I would lay in bed and watch the sailboats go by. A great way to liven up sheets is with homemade sachets. You can mix loose tea with dried herbs, ginger, cinnamon sticks, or dried orange or lemon peel, or simply place several drops of your favorite essential oil on cotton. Fill little fabric bags with your choice of sweet smelling stuffing then place the sachets in the linen closet between your sheets and pillow cases. When guests come, pull fresh sheets out and make up their bed. You'll leave them with a memory association, like Grandma Gloria did with ginger. Each time your guest smells that scent, they'll think of you! 3. Be prepared when your guests aren't. Grandma Gloria had a coat rack in the corner where she kept extra coats, scarves, umbrellas, and a row of boots lined up beneath. We didn't always think to bring such things in the summer. Sometimes we'd leave home with the sun in the sky, only to discover rain at Grandma's. And though we might've brought sandals, boots are better on a pebbly beach where you're digging for gooey-ducks or clams. People don't always think about what they'll need when they get to where they're going. How many times have you forgotten a toothbrush? You're guests will really appreciate it when you're prepared to fill in the gaps. Grandma Gloria was a natural at hospitality. I could go on with the things I observed. But I'm sure you have lots of ideas too. What are some of your favorite places to visit? I'd love to hear your story. And, Gloria always had a pot of soup waiting on the stove. No pressure...."get here when you can!" And, the soup was ready, whether we got there at 6:00 or 10:00 PM! I learned much from her, too, Joy! I love it! I remember the soup, too. The house always smelled so good when we'd walk in. Then we'd all sit down and catch up over the meal. I think as far a hospitality goes... It's more the vibe of the people than specific things done that have made me feel comfortable. I've been offered a drink in a house that really didn't feel comfortable and I've felt totally at home in a space where the people are just warm and friendly without anything offered or done. Memories of Grandma are the best...you always learn many life lessons. Amazing how a smell can tug at the heart strings. Thanks for sharing Joy!! !